Imagine waking up one morning only to discover that all your fish are floating upside down at the top of your aquarium. You feel the water only to discover that it is boiling. You have cooked your fish! This scenario is more common than you might think. All it takes is for your heater to remain on longer than it should, and you risk overheating your fish. That’s where an aquarium heater controller comes in. This important device may just save your fish’s life. And today, I am going to teach you all about it. What is an aquarium heater controller, and how does it work? Why do you need an aquarium heater controller? How do you choose the right heater controller for your aquarium? What is the best aquarium heater controller? As the name suggests, an aquarium heater controller allows you to precisely regulate the temperature of your fish tank – much more accurately than just using an aquarium heater alone. 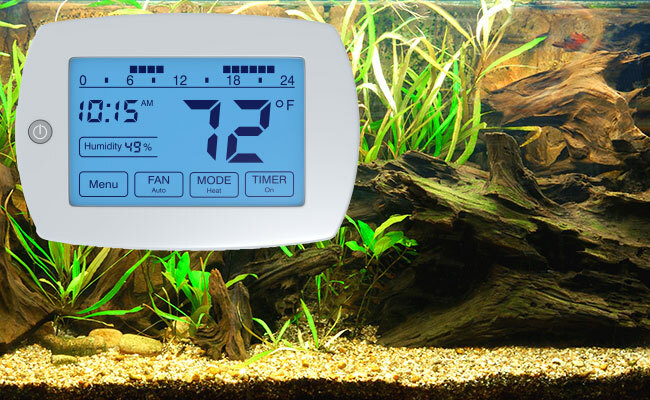 Think of a temperature controller as an external thermostat specifically for your fish tank. 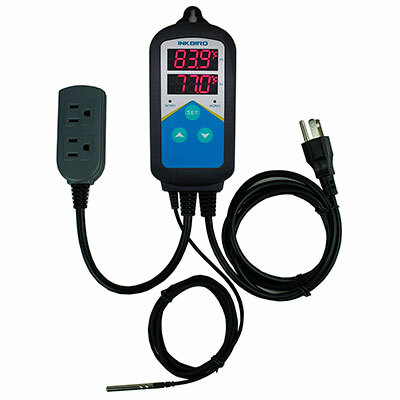 Pre-wired temperature controller – Comes as a complete unit. Simply plug your heater in, and you are good to go. No more effort required! DIY temperature controller – As the name suggests, you buy the parts separately and create your own temperature controller. Electrical knowledge is recommended if attempting to create your own. The controller consists of a digital LCD screen and buttons that you can use to set the desired temperature. This is the brains of the equipment. The controller monitors the water in your aquarium to ensure that it is always at the correct temperature. Pretty self-explanatory. This is where the plug from your aquarium heater goes. 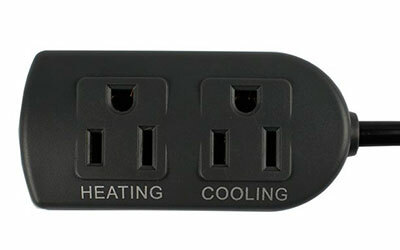 Some temperature controllers come with two independent outlets – one for a heater and another for a chiller. These are called dual temperature controllers, and they allow the controller to heat the water when it’s too hot and cool the water when it’s too cold. The waterproof probe sits inside your aquarium and measures the temperature of the water. Be mindful that if you have a saltwater tank, you will want a probe that is resistant to corrosion. How does the temperature controller work? Without boring you with the complicated technical details, how a temperature controller works is actually very simple. Using the controller, you set the desired temperature. In this case, I am going to set it to 79 degrees Fahrenheit (26 degrees Celsius) – because that’s what my angelfish prefer. Using the sensor probe inside your tank, the temperature controller will read the temperature and compare it to the temperature that you set. If the temperature is colder than what you have set, the controller sends power to the sockets, which turns on your heater. Once the temperature is reached, it shuts the heater off until the temperature drops again. Why you need an aquarium heater controller? It’s very likely that the aquarium heater you use already has a thermostat inside it. And when it reaches a certain temperature, it turns itself off. So then, why do you need a temperature controller for your aquarium? Well, the reality is that heaters fail. Your heater could fail due to poor manufacturing, incorrect installation, user error, electrical fault or any other number of reasons. But if it does fail, your tank will overheat, and you can kiss your tropical fish, plants and corals goodbye. It’s an expensive accident that can be prevented with an aquarium temperature controller. Once the water reaches the temperature you set, the controller will kill the power to your heater, turning it off. If your aquarium heater also has a thermostat, then the temperature controller is an extra layer of safety. 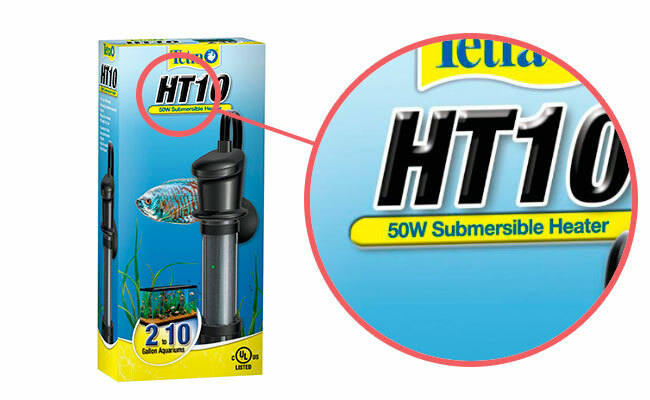 I have to hand it to modern aquarium heaters – they manage to squeeze a thermostat, temperature sensor and heater element into a tiny product that barely takes up any room in your tank. But the downside is that these components are not as accurate. If you need a narrow temperature range for breeding or have very sensitive fish, then you need a more accurate way to determine the temperature of the water. That’s where a controller comes in – offering a precise measurement of the water temperature. 1. What heater do you need to control? As you are probably aware, the power of your aquarium heater is measured in watts (W). You can find the wattage rating of your heater printed on the box or in the manual of your aquarium heater. This rating needs to fall in line with what the temperature controller outputs, otherwise the controller may fail. Let’s say the temperature controller has an output of 1000W. This means that it can control one 1000W heater, two 500W heaters or any combination of heaters adding up to 1000W. But if you need the temperature controller to run an 1100W heater, you risk the temperature controller failing. So, you want to make sure that your heater wattage is equal to or less than the output wattage of the temperature controller. Note: Most temperature controllers are more than capable of handling heaters for smaller tanks – this is mostly an issue for larger tanks that need bigger heaters. 2. 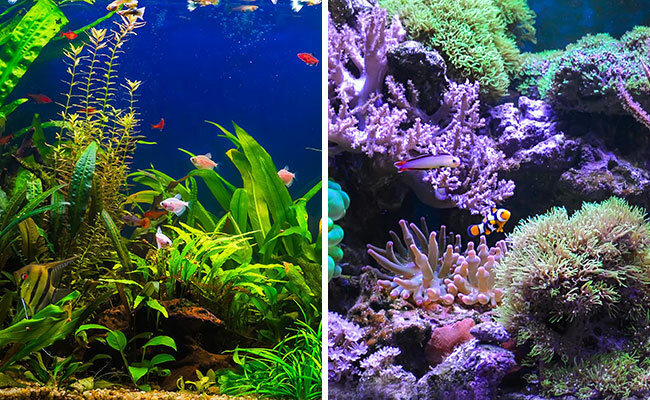 Is your tank freshwater or saltwater? 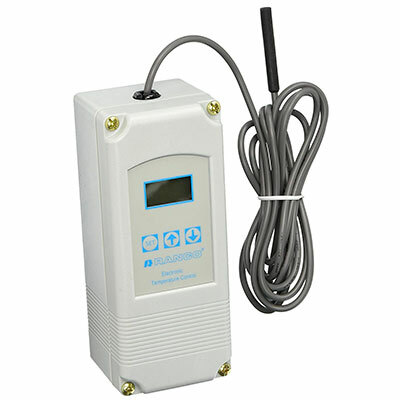 Good news for those of you with freshwater tanks – you can use any waterproof probe to measure the temperature. But those of you with saltwater tanks may experience some grief. Yep, that salt water quickly corrodes most metals, including your temperature probe. Fortunately, many temperature controllers allow you to swap out the probes. Simply buy a temperature probe that is saltwater friendly (titanium is a good choice), and you are set. If swapping out the sensor isn’t an option, try a DIY solution. This was recommended to me by a couple of reef tank enthusiasts. You can either seal the probe in an epoxy or cover it with heat shrink. I have not tried either of these solutions and would love to hear from any of you who have had success with these methods. 3. Do you also need to cool your tank if it gets too hot? A temperature controller that performs just one function, such as heating, is called a single stage temperature controller. But you can also buy temperature controllers that allow you to both heat and cool your tank. These temperature controllers are referred to as dual stage temperature controllers. How a dual stage temperature controller works is actually really simple. Whatever you plug into the cooling socket will activate if the temperature in your aquarium is above the preset temp. And, anything that you plug into the heating socket will activate if the temperature falls below your preset temp. This allows you to keep your tank in an extremely narrow temperature range regardless of the temperature outside the tank. 4. What are your DIY skills? Last but not least, your electrical skills and knowledge play a major part in what temperature controller you use. Just want a simple option that you plug in and forget about? Then, you want a pre-wired temperature controller. As the name suggests, this controller comes as a complete unit. Simply plug it in, and you are ready! But if you want specific features or need to use a heater that exceeds the capabilities of pre-wired models, then you will need to wire it yourself. Want to create a temperature controller that heats at different temperatures during the day and night? You can do that. Want an alarm to sound at a specific temperature? You can do that too. You are only limited by the components that you add to the circuit. While this DIY approach allows you to create a custom temperature controller to suit your exact needs, it does have an element of danger. If wired incorrectly, you risk serious harm to both yourself and your fish. And while it may look safe, you could have accidentally created a ticking time bomb. If you need a custom temperature controller, I recommend buying the components yourself and then paying a qualified electrician to wire it. Remember, it’s okay to pay someone for the skills you lack! Now that you are familiar with the basics, it’s time to take a look at some of the most popular and reliable temperature controllers on the market. The Inkbird pre-wired temperature controller is perfect for beginners and those who like to keep things simple. 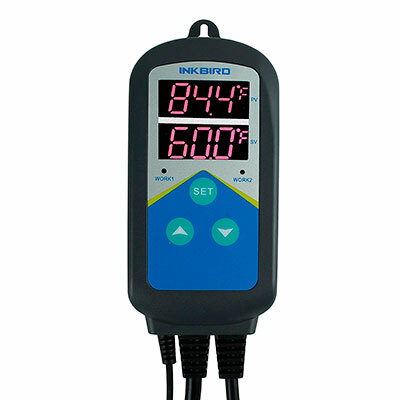 The Inkbird ITC-306T offers complete temperature control at an affordable price. But best of all… It just works. Setting up the temperature controller takes just minutes. 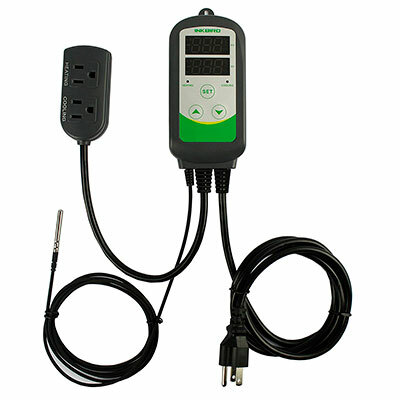 Plug in the temperature controller, plug in your heaters, place the sensor in your tank and set the temperature limit. What I like best is the twin digital LCD screens. One shows the current temperature of your tank while the other shows the maximum temperature you want it to reach. Inkbird also has a couple of handy safety features included – an alarm sounds if the sensor probe has a fault or if the tank water exceeds the temperature you set. But what if you need both heating and cooling? Well, Inkbird has a product for that too. The ITC-308T works the same as the ITC-306T with one small exception – it allows you to heat your tank when the water is too hot and cool your tank when the water is too cold. It does this by using dedicated sockets – one for your chiller or fan and the other for your heater. 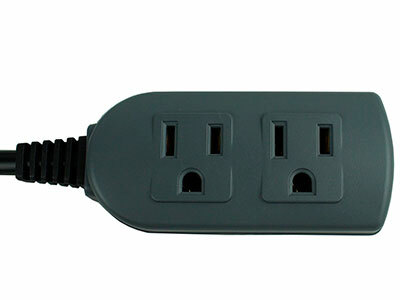 Each outlet is activated independently, depending on the temperature of the water. Inkbird also makes a WiFi Smart Temperature Controller that allows you to view the temperature and receive alerts on your smartphone. Being able to monitor the temperature of your tank sounds pretty handy, right? At the time of writing, I could not get the app to work with Apple’s newest iOS release. And as for Android, user reviews report that it’s plagued with problems. I have yet to come across an affordable (under $100), reliable and easy-to-use prewired WiFi temperature controller. I have tried Inkbird and Willhi’s models but cannot recommend them based on my experience. If you know a great WiFi temperature controller that fits the above criteria, please let me know in the comments! For those of you who are just looking for quality components to make your own temperature controller, look no further. The Ranco, by Robert Shaw, temperature controller is used in a wide variety of industrial applications, from beer brewing to HVAC systems. And, it’s just as suitable for your aquarium. The unit is well documented with easy-to-understand wiring guides, specifications and instructions. You can grab a PDF copy of the manual here. Please note that the model above is a single stage temperature controller. While you can use it to heat or cool your aquarium, it can only do one at a time and will need to be re-wired if you want to swap it over. The dual stage model allows you to wire both a chiller and heater at once. You can find it here, and the instruction manual here. Johnson Controls also makes fantastic temperature controls, manufactured right here in the USA. These industrial-grade temperature controllers are praised by technicians for their reliability and build quality. Check it out here, and view the instruction manual here. While both are great temperature controllers, I recommend Robert Shaw’s Ranco because it is more widely available, often at a cheaper price. 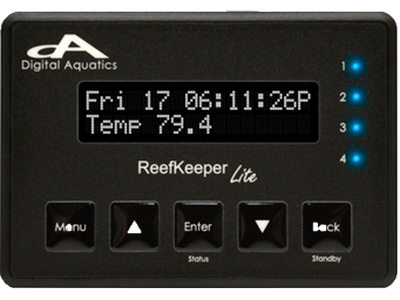 The ReefKeeper Lite comes with a temperature probe, power bar and controller. At first glance, this is an overpriced temperature controller. But if you dig deeper, you will see that this little device is capable of so much more. The ReefKeeper basic comes with many presets for temperature control, lighting, wavemakers, dosers, etc. It’s a temperature controller and so much more. If you have a reef tank, then this is an invaluable tool. And best of all, it is expandable – you can unlock even more features by purchasing additional modules. This device is a reef tank owner’s best friend. As you see, a temperature controller is an essential fail safe for your aquarium. Imagine how costly it will be to replace everything if your heater fails. What do you use as a temperature controller? Let me know in the comments below! Have you evaluated Finnex temperature controllers? I’ve heard a lot of gripe about Inkbird reliability issues. Great question. I have and I don’t really have any complaints about them. However, they are more expensive and the unit isn’t as nice. When originally researching I found just as many complaints about the Finnex as I did the Inkbird – I had no problems with either. No, I have not used their Titanium heater, I have played around with their quartz and Submersible range. To put it bluntly, they were hot garbage – I had failures in both ranges, two got “stuck on” while another failed completely. That’s ignoring highly inaccurate temperature displays. They still sell both of these heater models. I would not trust either in my own aquariums. I have used The Finnex Titanium heater which also comes with it’s own temperature controller. It’s not a bad unit and comes with a heater guard. In my opinion this heater guard is essential. Titanium DOES get hot. Hot enough to burn your fish if they get too close. It appears that Hygger do not include a heater guard with their titanium unit, even though their cheap poor performing models do. I pick up a deep handy box at the hardware store, cutout one side for the controller and install an outlet and cover plate on the top. I’ve had half a dozen in use for several years. Have you done testing on actual heaters and have a post about which are the most reliable and accurate heaters? This is actually the next guide in the works, I am just putting the final touches on my air pump guide which took longer than expected (I tested 60 of them for both power at various depths and noise given off.) once this is done I will start the heater guide. Of these, Cobalt is currently my favorite and what I use in my aquarium. However, next week I re-test these heaters and begin testing others including Fluval, Marina, and other models in a giant comparison review. I cannot give an ETA but these big reviews generally take about a month to complete, it’s a big job! 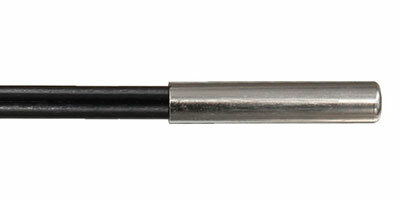 The ITC-308 uses a metal probe. I have seen many people use this in their salt water tank, however they apply a thin layer of aquarium safe silicone around it, to stop rust and corrosion. Is the pre wired probe more dependable or ? I personally run three 306 and have not had an issues with them. I heard there was an issue on amazon where there were “counterfeit models” being sold by certain sellers, which is problematic for buyers. Unless you want to jump up to something like a reefkeeper, or similar aquarium monitoring solution which can get pricey, or try your hand at a DIY solution (ranco makes great temperature controllers) this is as good as it gets. By any chance have you used your 306 to control an Aqueon Pro heater? The reason I’m asking is the Aqueon Pro’s are the only heaters I use and I seem to remember reading somewhere they’re not compatable with the Inkbird 306! I can’t for the life of me remember or understand why that might be though I’m almost certain I’d read that they weren’t! Any info you can supply will be greatly appeciated! That’s interesting, I have never heard of this. Just to clarify, I do not run Aqueon pros in my tanks, so I cannot speak from experience, but logically thinking about it, I don’t see how it could not be perfectly compatible. 1. It supplies power to the heater. It shouldn’t make a difference what is plugged in. The temperature controller MUST provide 120V at 60Hz. As long as the heater meets the maximum wattage the temperature controller can output, everything should be fine here. The thermometer doesn’t care what is plugged in. It just measures water temperature. 3. It turns the heater off if the temp goes past your preset setting. This feature is based off the thermometer reading and has nothing to do with what is plugged in. There isn’t anything that stands out to me as a conflict with an Aqueon Pro. Finally, there really isn’t anything unique about the aqueon pro that isn’t found on other heaters that I can confirm are commonly used with an Inkbird, such as the Cobalt Neotherm or Eheim Jager. All have your basic heating element, a bimetal thermostatic switch and an adjustable temperature. If the Aqueon pro wasn’t recommended, then neither would these heaters. These are just my thoughts, I hope it helps. What temperature range are your controllers validated to? This information is listed in the guide and varies according to brand. The Inkbird LTC-308 for instance has a control range between -58~210 °F. However, if you are referring to accuracy, then ±1 °F (-50~160 °F). Perfect for your typical aquarium owner. The InkBird ITC-308 is a piece of junk. Out of the box it is malfunctioning. Heater only stays on for a few minutes. The temp reading is inaccurate and fluctuates on it’s inaccuracy. It cost $35 to have an inaccurate thermometer, as the heater needed to be plugged into the power distribution center instead of the inkbird POS. Temp needed to be between 75 and 80, not 74.5. But, the temp was not 74.5, used a different thermometer, one I know is very accurate. It read 70.3. Thanks for your input. It’s possible you have a faulty unit. We did not find the same during testing. We have used high end calibrated thermometers that cost hundreds of dollars to verify it’s accuracy, (Fluke 51-1 and SP Scienceware) the same thermometers we used to test the accuracy of aquarium thermometers here. Between the staff, in addition to the two we tested, we have 3 inkbird heater controllers and all work as expected. While hardwired temperature controllers are arguably more accurate and reliable, they are more costly and require you to correctly wire up the device. We will be revisiting this guide next year and retesting these heater controllers as well as any new models released between now and then. At the time of testing, for people seeking a plug and play option, I believe the Inkbird is the best choice on the market. I’m sorry to hear you didn’t have the same experience, are you able to return your faulty product for a replacement? Your sample size of one really doesn’t lend any strength to your bold claims. There isn’t anything manufactured by anyone, anywhere at any point in history where 100% of the products made worked perfectly. These are consumer products and built to that standard. Scientific instruments are built to an entirely different standard and the price will reflect that. The key in situations when you have received a faulty product is good customer service.